represents a log-gamma distribution with shape parameters α and β and location parameter μ.
LogGammaDistribution is at times confused with ExpGammaDistribution. 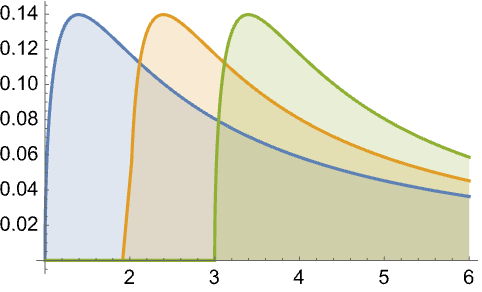 The probability density for value is proportional to for , and is zero otherwise. 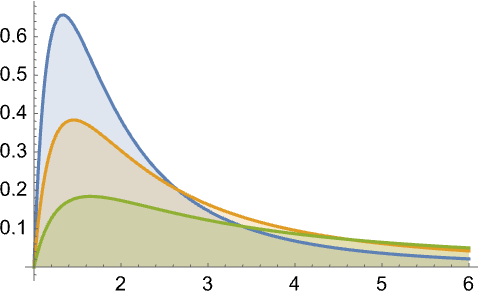 The LogGammaDistribution[α,β,μ] is equivalent to TransformedDistribution[Exp[x]+μ-1,xGammaDistribution[α,β]]. 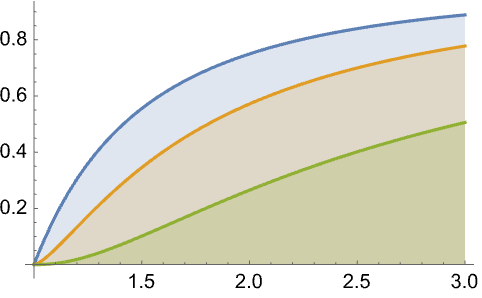 LogGammaDistribution allows α and β to be any positive real numbers and μ any non-negative real number. 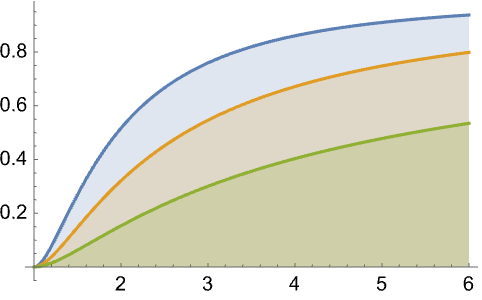 LogGammaDistribution can be used with such functions as Mean, CDF, and RandomVariate. LogGammaDistribution[α,β,μ] represents a continuous statistical distribution supported over the interval and parametrized by a non-negative real number μ (called a "location parameter") and by positive real numbers α and β (called "shape parameters") that together determine the overall behavior of its probability density function (PDF). Depending on the values of α and β, the PDF of a log-gamma distribution may be either unimodal with a single "peak" (i.e. a global maximum) or monotone decreasing with a potential singularity approaching the lower boundary of its domain. In addition, the PDF of the log-gamma distribution has tails that are "fat" in the sense that its PDF decreases algebraically rather than exponentially for large values of . (This behavior can be made quantitatively precise by analyzing the SurvivalFunction of the distribution.) Distributions whose densities are proportional to the PDF of ExpGammaDistribution are sometimes mistakenly referred to as LogGammaDistribution, though such distributions can be distinguished from the actual log-gamma distribution by the doubly-exponential behavior of their PDFs. LogGammaDistribution is the distribution followed by the logarithm of a gamma-distributed random variable. In other words, if is a random variable and (where denotes "is distributed as"), then . It was shown in a 1971 paper by Consul and Jain that the log-gamma distribution can be used as an approximation tool both to determine the independence of two sets of normally-distributed random variables as well as to test linear hypotheses regarding matrix regression coefficients. The log-gamma distribution can also model a variety of phenomena including income distribution and arrival and departure times in queueing theory, and generalizations thereof have been used as prior distributions in Bayesian analysis to allow for the inclusion of prior knowledge regarding correlations between parameters when likelihood is non-normally distributed. RandomVariate can be used to give one or more machine- or arbitrary-precision (the latter via the WorkingPrecision option) pseudorandom variates from a log-gamma distribution. Distributed[x,LogGammaDistribution[α,β,μ]], written more concisely as xLogGammaDistribution[α,β,μ], can be used to assert that a random variable x is distributed according to a log-gamma distribution. Such an assertion can then be used in functions such as Probability, NProbability, Expectation, and NExpectation. 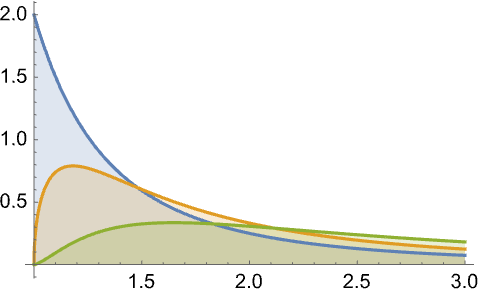 The probability density and cumulative distribution functions for log-gamma distributions may be given using PDF[LogGammaDistribution[α,β,μ],x] and CDF[LogGammaDistribution[α,β,μ],x]. The mean, median, variance, raw moments, and central moments may be computed using Mean, Median, Variance, Moment, and CentralMoment, respectively. DistributionFitTest can be used to test if a given dataset is consistent with a log-gamma distribution, EstimatedDistribution to estimate a log-gamma parametric distribution from given data, and FindDistributionParameters to fit data to a log-gamma distribution. ProbabilityPlot can be used to generate a plot of the CDF of given data against the CDF of a symbolic log-gamma distribution, and QuantilePlot to generate a plot of the quantiles of given data against the quantiles of a symbolic log-gamma distribution. TransformedDistribution can be used to represent a transformed log-gamma distribution, CensoredDistribution to represent the distribution of values censored between upper and lower values, and TruncatedDistribution to represent the distribution of values truncated between upper and lower values. CopulaDistribution can be used to build higher-dimensional distributions that contain a log-gamma distribution, and ProductDistribution can be used to compute a joint distribution with independent component distributions involving log-gamma distributions. 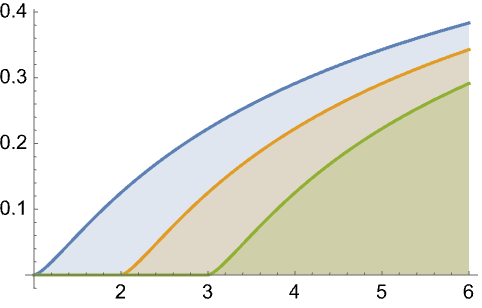 LogGammaDistribution is related to a number of other distributions. LogGammaDistribution can be realized as a transformation (TransformedDistribution) of GammaDistribution in the sense that the PDF of TransformedDistribution[Log[u+1],uLogGammaDistribution[α,β,0]] is precisely the same as that of PDF[GammaDistribution[α,β],x]. Its logarithmic behavior is also qualitatively similar to that of LogLogisticDistribution, LogMultinormalDistribution, and LogNormalDistribution.